Bees, along with some birds, reptiles andother insects, can see near-ultraviolet lightreflecting off of plants. Bug zappers attractinsects with ultraviolet light to lure themto the trap. Ultraviolet (UV) light has shorter wavelengths than visible light. Although UV waves are invisible to the human eye, some insects, such as bumblebees, can see them. This is similar to how a dog can hear the sound of a whistle just outside the hearing range of humans. The Sun is a source of the full spectrum of ultraviolet radiation, which is commonly subdivided into UV-A, UV-B, and UV-C. These are the classifications most often used in Earth sciences. UV-C rays are the most harmful and are almost completely absorbed by our atmosphere. UV-B rays are the harmful rays that cause sunburn. Exposure to UV-B rays increases the risk of DNA and other cellular damage in living organisms. Fortunately, about 95 percent UV-B rays are absorbed by ozone in the Earth's atmosphere. 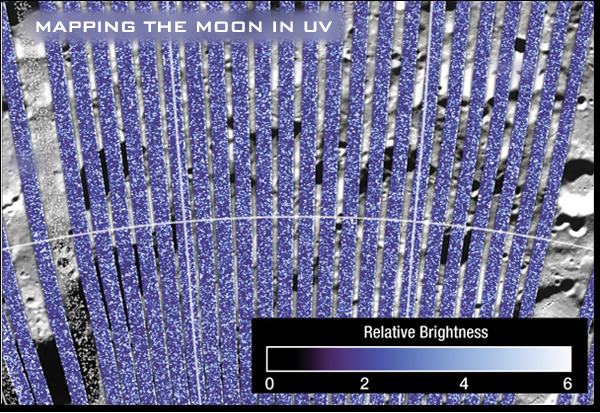 Scientists studying astronomical objects commonly refer to different subdivisions of ultraviolet radiation: near ultraviolet (NUV), middle ultraviolet (MUV), far ultraviolet (FUV), and extreme ultraviolet (EUV). 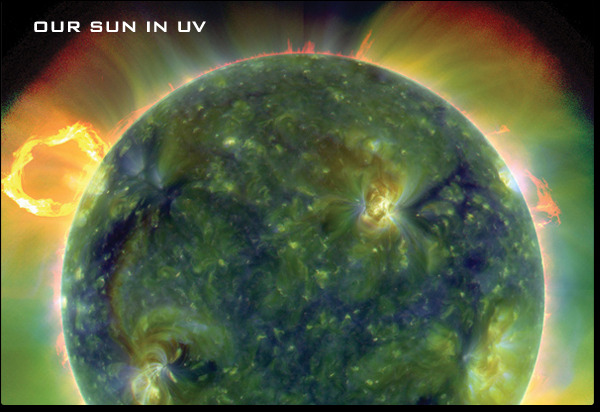 NASA's SDO spacecraft captured the image below in multiple wavelengths of extreme ultraviolet (EUV) radiation. The false-color composite reveals different gas temperatures. Reds are relatively cool (about 60,000 Celsius) while blues and greens are hotter (greater than one million Celsius). In 1801, Johann Ritter conducted an experiment to investigate the existence of energy beyond the violet end of the visible spectrum. 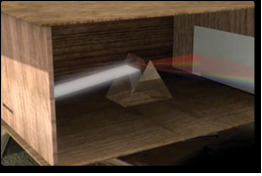 Knowing that photographic paper would turn black more rapidly in blue light than in red light, he exposed the paper to light beyond violet. Sure enough, the paper turned black, proving the existence of ultraviolet light. 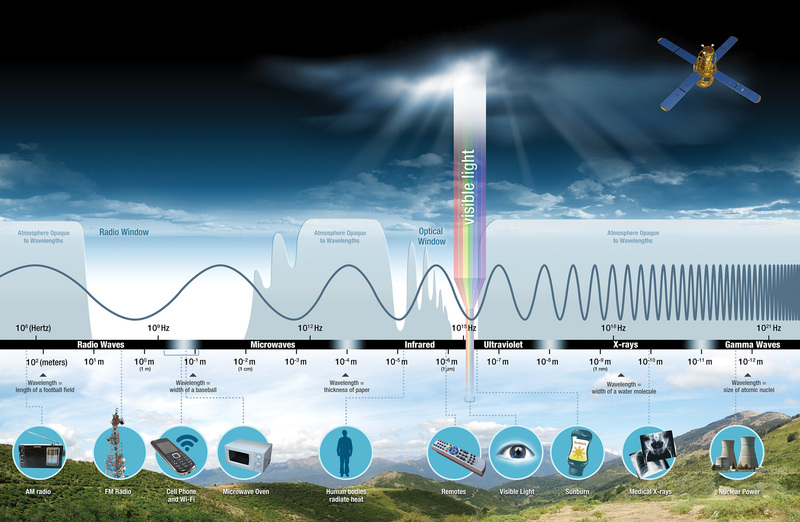 Since the Earth's atmosphere absorbs much of the high-energy ultraviolet radiation, scientists use data from satellites positioned above the atmosphere, in orbit around the Earth, to sense UV radiation coming from our Sun and other astronomical objects. Scientists can study the formation of stars in ultraviolet since young stars shine most of their light at these wavelengths. This image from NASA's Galaxy Evolution Explorer (GALEX) spacecraft reveals new young stars in the spiral arms of galaxy M81. 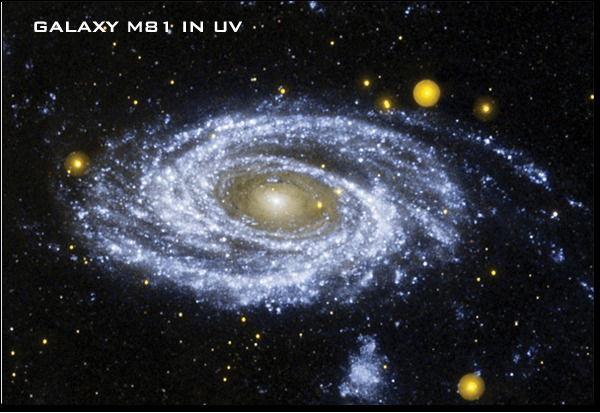 The image to the right shows three different galaxies taken in visible light (bottom three images) and ultraviolet light (top row) taken by NASA's Ultraviolet Imaging Telescope (UIT) on the Astro-2 mission. The difference in how the galaxies appear is due to which type of stars shine brightest in the optical and ultraviolet wavelengths. 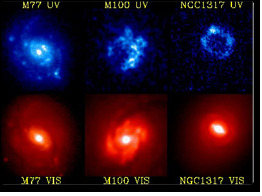 Ultraviolet images of galaxies show mainly clouds of gas containing newly formed stars that are many times more massive than the Sun and glow strongly in ultraviolet light. In contrast, visible light images of galaxies show mostly the yellow and red light of older stars. By comparing these types of data, astronomers can learn about the structure and evolution of galaxies. Chemical processes in the upper atmosphere can affect the amount of atmospheric ozone that shields life at the surface from most of the Sun's harmful UV radiation. Each year, a "hole" of thinning atmospheric ozone expands over Antarctica, sometimes extending over populated areas of South America and exposing them to increased levels of harmful UV rays. 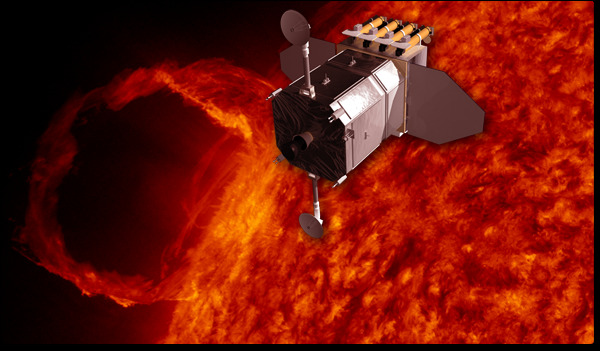 The Dutch Ozone Monitoring Instrument (OMI) onboard NASA's Aura satellite measures amounts of trace gases important to ozone chemistry and air quality. The image above shows the amount of atmospheric ozone in Dobson Units—the common unit for measuring ozone concentration. These data enable scientists to estimate the amount of UV radiation reaching the Earth's surface and forecast high-UV-index days for public health awareness. The Lyman-Alpha Mapping Project (LAMP) onboard the Lunar Reconnaissance Orbiter can peer into permanently shaded craters on the moon by sensing the faint reflections of UV light coming from distant stars. Aurorae are caused by high-energy waves that travel along a planet's magnetic poles, where they excite atmospheric gases and cause them to glow. Photons in this high-energy radiation bump into atoms of gases in the atmosphere causing electrons in the atoms to excite, or move to the atom's upper shells. When the electrons move back down to a lower shell, the energy is released as light, and the atom returns to a relaxed state. The color of this light can reveal what type of atom was excited. Green light indicates oxygen at lower altitudes. Red light can be from oxygen molecules at a higher altitude or from nitrogen. 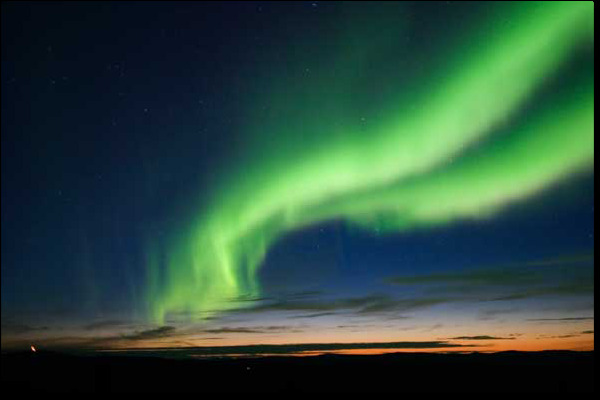 On Earth, aurorae around the north pole are called the Northern Lights. 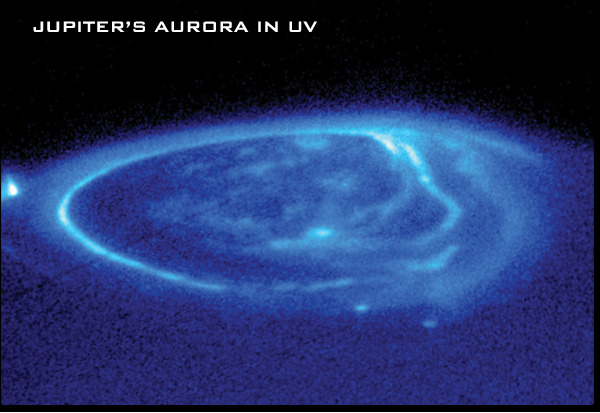 The Hubble Space Telescope captured this image of Jupiter's aurora in ultraviolet wrapping around Jupiter's north pole like a lasso. This unusual false-color image shows how the Earth glows in ultraviolet (UV) light. The Far UV Camera/Spectrograph deployed and left on the Moon by the crew of Apollo 16 captured this image. The part of the Earth facing the Sun reflects much UV light and bands of UV emission are also apparent on the side facing away from the Sun. These bands are the result of aurora caused by charged particles given off by the Sun. They spiral towards the Earth along Earth's magnetic field lines.